Wednesday, May 15, 2019 - at Wood Basic Science Building Auditorium. Registration is now open and runs through 5/8/2019 10:59 PM Central Time (US & Canada). An official course agenda will be made available shortly. To view the Provider Course flyer, click the link below. 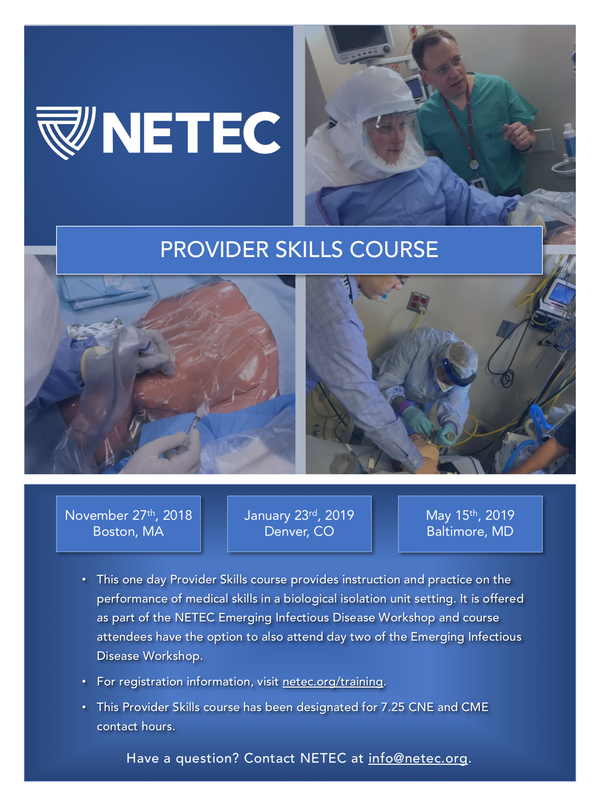 Click here to download the NETEC Provider Skills course flyer. NOTE: All attendees should be comfortable with the performance of the above skills in their usual clinical practice, since instruction will focus on the use of these skills in an isolation setting wearing PPE. There is no tuition cost for this program. NETEC and its partners are not responsible for any losses incurred by registrants, including but not limited to airfare cancellation or hotel deposits. No travel funding is available to participants from NETEC. TRAVEL ARRANGEMENTS: Please do not make travel arrangements until your workshop registration has been approved. Participants are asked to bring their facility's full PAPR “wet” level or equivalent PPE. Each attendee will be wearing full PPE for this course. PPE Requirements: Full institutional ensemble for two days, to include suit or gown, shoe covers, apron (if used), PAPR or equivalent, to include belt and battery, gloves. There are several hotels located near Johns Hopkins Hospital. Please do not make travel arrangements until you have received an approval. of Nebraska Medical Center, Center for Continuing Education and NETEC. The University of Nebraska Medical Center, Center for Continuing Education is accredited by the ACCME to provide continuing medical education for physicians. The University of Nebraska Medical Center, Center for Continuing Education designates this live activity for a maximum of 7.25 AMA PRA Category 1 Credits™. Physicians should claim only the credit commensurate with the extent of their participation in the activity. Emory Nursing Professional Development Center (ENPDC) is accredited as a provider of continuing nursing education by the American Nurses Credentialing Center's Commission on Accreditation. Attendees to this CNE activity will be awarded up to 7.25 contact hours by ENPDC. No conflict of interest has been found with the speaker for this CNE activity nor with the members of the planning committee. The Office of the Assistant Secretary for Preparedness and Response (ASPR) and the Centers for Disease Control and Prevention (CDC) have established the National Ebola Training and Education Center (NETEC) to increase the competency of healthcare and public health workers and the capability of healthcare facilities to deliver safe, efficient, and effective Ebola patient care. The National Ebola Training and Education Center is comprised of faculty and staff from Emory University, the University of Nebraska Medical Center/Nebraska Medicine and the New York Health and Hospitals Corporation, Bellevue Hospital Center. All three of these healthcare institutions have safely and successfully treated patients with Ebola and have worked diligently over the past year to share their knowledge with other healthcare facilities and public health jurisdictions. The goal of the NETEC is to combine these resources into one comprehensive assessment, educational and training tool for healthcare systems throughout the United States. Please contact NETEC at info@netec.org.